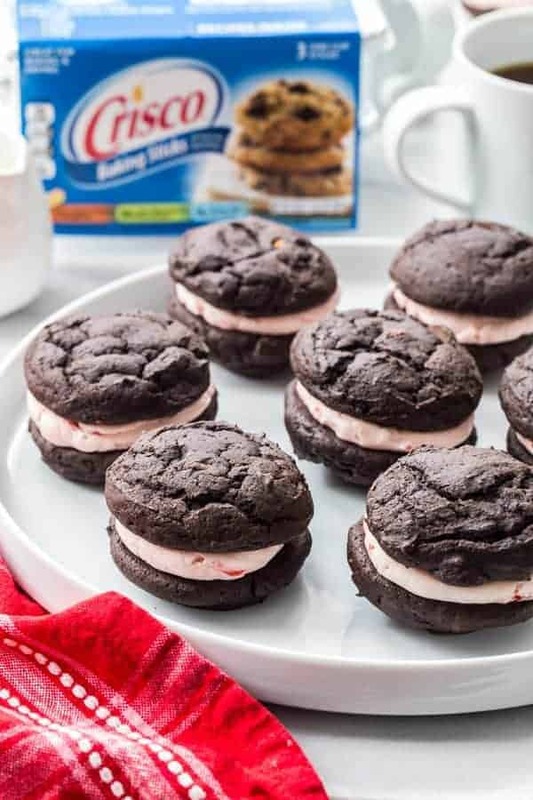 Chocolate Cherry Sandwich Cookies are a stunning way to show your love this Valentine’s Day. Grown-ups and kids alike will love these sweet sandwich cookies. I’m partnering with Crisco as part of the Crisco Creators. This post is compensated as part of that partnership. All opinions are my own. Thank you for continuing to support the companies that make My Baking Addiction possible. What are you doing for Valentine’s Day this year? Have you even started to think about it? I know, I know, it’s barely February, but this is one of those holidays that can sneak up on you, and I’m nothing if not exceptionally prepared for every festive holiday. Lots of people like to buy boxes of chocolates or flowers for their loved ones this time of year, but me – I’m all about the homemade treats. 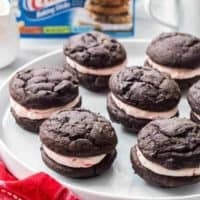 These Chocolate Cherry Sandwich Cookies are the perfect example. 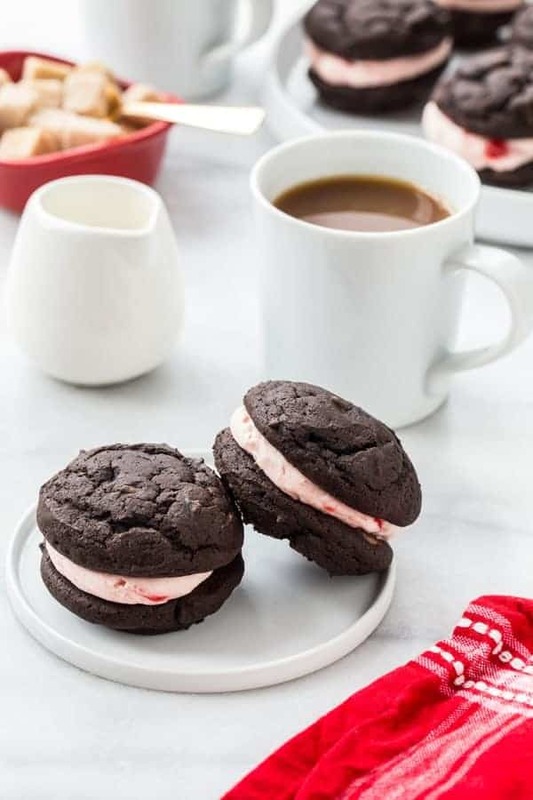 Decadent dark chocolate cookies pair wonderfully with sweet Maraschino cherry buttercream, for one truly spectacular Valentine’s Day dessert. They’re substantial enough that you can even tuck them into lunch boxes for school or the office and know that they’ll be just fine come lunch time. I love the idea of this for when Elle is old enough for school. Not that I want to think about that too hard right this second. These sandwich cookies are a bit sturdier than your typical drop cookie, making them great for turning into sandwiches. They won’t fall apart when you take a bite, or if you’re like a certain someone in this house, and must twist apart any sandwich cookie you find and eat the filling first. I used Crisco® All-Vegetable Shortening to make the cookie dough, because it makes for a taller cookie, with lighter texture. It’s moist and tender, and I’d be lying if I said I didn’t eat a few of these cookies right off the tray, sans frosting, just because. I really like using Crisco® All-Vegetable Shortening Baking Sticks. As you can see in the video, they’re super easy to measure, and are just a no muss, no fuss way to add perfect texture to your baked goods. They’re always just the right texture, straight out of the pantry. Each wrapper has clearly marked measurements, so all you have to do is cut the bar where the measurement you need is located. No scooping and leveling required! Let’s talk a little bit about this buttercream, because whoa. I use a little bit of Maraschino Cherry juice straight from the jar, along with chopped up cherries. They add such good flavor to this frosting! When you combine chocolate and cherries, there’s really nothing more to be said. 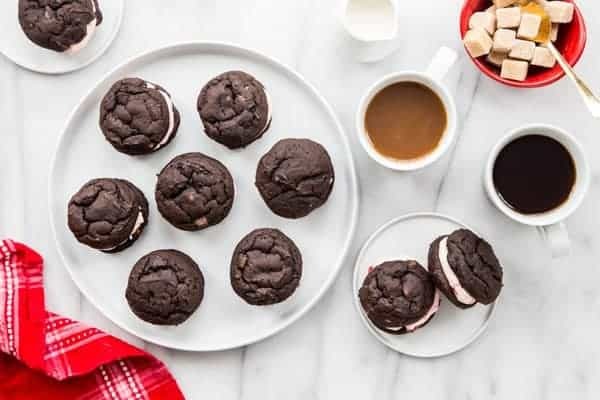 It’s classic, it’s amazingly sweet and delicious, and I can’t think of a more adorable Valentine’s Day treat for your favorite people. 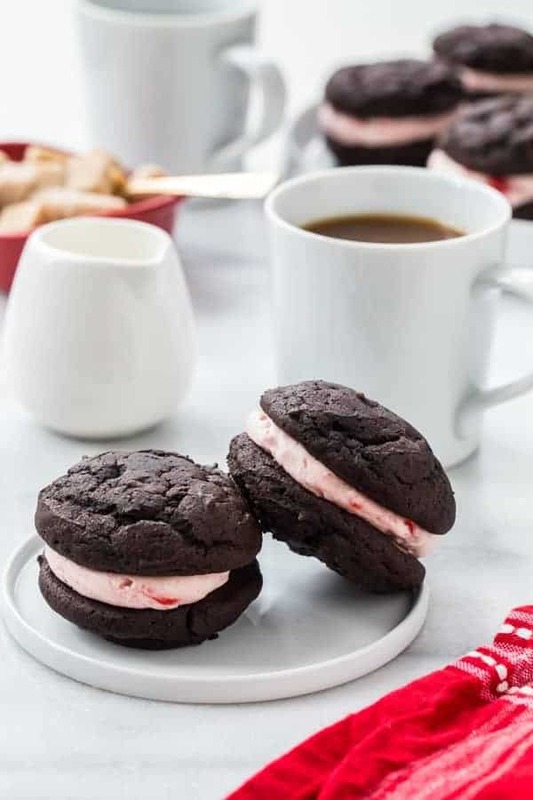 I bet these Chocolate Cherry Sandwich Cookies will become a Valentine’s Day tradition, and I can’ think of anything more lovely. Have a wonderful, love-filled day! I teamed up with Crisco® to help inspire home cooks with new recipes and baking tips. Visit Crisco.com or search #CriscoCreators on social media to find more great recipes! Preheat the oven to 400°F. Line baking sheets with parchment paper. In the bowl of a stand mixer fitted with the paddle attachment, or in a large bowl with an electric mixer, cream together the shortening and sugar until light and fluffy. Add in the egg, vanilla, buttermilk, and water and mix until the ingredients are fully incorporated. In a medium bowl, whisk together the flour, baking soda, cocoa, and salt. Slowly add the dry ingredients to the shortening mixture and mix until just combined. Use a rubber spatula to gently fold the chocolate chips into the batter. Use a medium cookie scoop (1.5 tablespoons) to drop batter onto prepared cookie sheets about 2 inches apart. Bake for 8-9 minutes in the preheated oven. Allow cakes to cool on baking sheets for 5 minutes before removing to wire racks to cool completely. In the bowl of a stand mixer fitted with the paddle attachment, beat the butter on medium-high speed for 3-4 minutes. Turn the mixer down to low speed and gradually add in the powdered sugar until thoroughly combined. Turn the mixer back up to medium-high speed and mix for 5 minutes. Add in the cherry juice and vanilla and beat an additional 2 minutes. Use a rubber spatula to fold the chopped cherries into the buttercream. *Note If the buttercream is too thick, you can add a little milk in 1 teaspoon at a time until the desired consistency is reached. Spoon or pipe the buttercream onto the flat sides of half the cookies and top with remaining cookies. They are perfect for Valentine’s Day, Roseanne! And I remember the big can, too! I hope you enjoy them. These look so delicious. I love the pink filling between the chocolate, yum. Perfect for valentines. Thank you so much, Edwina! You really do beautiful creations here ! Thank you so much ! I love chocolate and cherries put together!! Lovely recipe can I make these in advance and freeze ? Hi, Rossana! I would suggest making the cookies and freezing those. Then when you’re ready, defrost and pipe in the filling. I hope you enjoy them! What a fun and delicious idea!! I love me some chocolate! Made these yesterday for me geometry students. They were a hit! I especially like the bits of cherry that are in the frosting. I am so happy to hear they enjoyed them, Jaime! Thanks for stopping back and leaving your feedback. These cookies look so tasty! And they are so pretty with that pink filling, too!! Made them,everyone enjoyed. Would be great to show. Thanks so much for stopping by and leaving your feedback. So glad to know you enjoyed them. We need this in all Perth WA AUSTRALIA STORES. What do I used instead of cristo? You can use butter, they may just not be as puffy as the ones pictured. Thanks for stopping by. I love cookie sandwiches! These really do look perfect for the lunchbox. I’ve never baked with Crisco before but after discovering this recipe I think I’ll give it a try. Thanks so much for stopping by, Crystal! I appreciate you taking the time to comment. Happy Baking!